When it comes to chemical labels, there is no ‘one size fits all’ approach. The specification you need depends on a great number of factors – from the surface to which the label will be stuck, to the part of the world it will end up. To meet the BS5609 standard, there are three parts of your label that need to comply – the face, the backing and the adhesive. And just because one part is right, doesn’t mean the whole label complies. You could use the correct adhesive on office paper for example and it would just wash off – it’s the combination that has to be correct. Some adhesives don’t work with some paper – emulsion acrylic works better on PE foam than PP foam for example. Focus on the whole combination of the label and adhesive or you might find you have spent a significant amount of money on something that is essentially illegal. You might as well lick it like a postage stamp or write it in wax crayon! Look out for different types of adhesive – increasingly they tend to be emulsion acrylics rather than solvent-based adhesives. The amount of solvents used by businesses is significantly lower than it has been in the past due to a government drive to reduce the risk to the environment. Before commissioning your label, think about what it will be expected to withstand. What will its life cycle involve? Where will it go? What will it be exposed to? We have known chemical labels being shipped from winter in Wigan where it is -2°C to Qatar where it is 45°C – a huge variation. Changes in temperature and humidity need to be taken into account. Lastly, think about when you will apply your label. If, for example, you stick it to a drum and then immediately fill it with a hot product, the surface will expand. If you then take it out into a cold yard it will shrink back quickly which could lead to the labels becoming wrinkled or even coming off completely. There is an adhesive product that will stand that extreme variation in temperature but it is more expensive as it’s a higher specification. The most expensive consideration you might have is your production time so this product would fit in with your fast and dynamic processes. Knowing all this, is definitely half of the battle, that’s why we like to do a site visit with all our clients so we can see their processes first hand. It helps guide us to use the most appropriate materials. Prepare the surface before you put your label on – make sure there is no moisture on it and your label will stick better. Stick down all the parts of your label carefully rather than just slapping it on. Don’t stick your label to anything else before the surface it was designed for. Ask yourself what the label’s lifecycle will be and what it will be exposed to. If you don’t know, it will be poorly specced and might not look as good or stick as well as it could have done. Make sure that the ink you use to add the variable information on to your label is right for the material – for example, wax ribbons work better on matt label surfaces. Take time to think about your chemical labels. A couple of minutes’ care could save your business cost and reputation in the long term. A bespoke solution, using specially supplied labels or individually adapted printing software, is usually the best approach for the specialised chemicals industries. 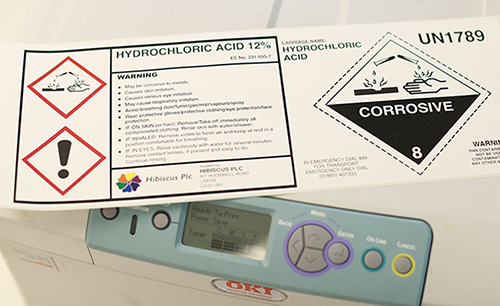 Hibiscus plc has over 30 years’ experience in the manufacture of quality bespoke chemical labels and we are one of the UK’s leading manufacturers of ADR hazard warning diamonds and placards, with thousands of labels in stock. We also produce ADR panels and holders for the transportation of hazardous materials by road. Hibiscus has developed software for the classification and labelling of hazardous substances and the authoring and management of Safety Data Sheets and we also provide printers and support so that businesses can print their own labels. If you need assistance with any aspects of labelling your products, you can call us on: 0113 2424272.